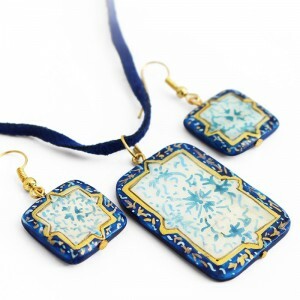 If you know about enameling, then you know about Minakari. Minakari or as some call it, "the Miniature on Fire", is the art of decorating and coloring precious metalware like gold, silver and sometimes copper. Minakari is enamelwork, but with certain differences from the sort of enamel craft you have in mind. Enamelwork is practiced all over the world: from China and India to Europe and Russia. However, each country has found a different way to do it, not to mention the different styles each of them have managed to create! 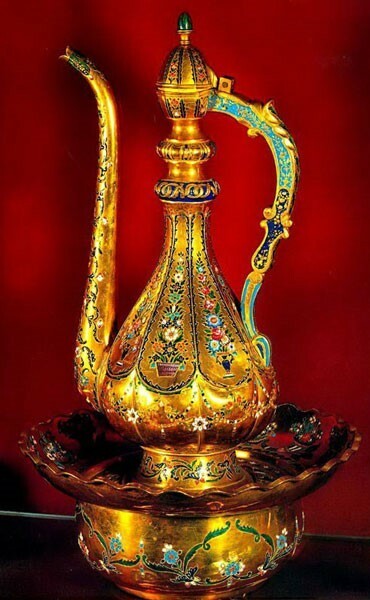 Minakari is the enamel work of Iran. This mixture of art, chemistry and craftsmanship has been around for a quite long time. A Minakari artwork will look like a sort of painting, but it is more than that. The colors are not your simple oil and water based colors we know; they are actually powdered metal oxides mixed with glass material. So as you see, the process of "coloring" is a little bit different. I'm gonna take you step by step through all you need to know about this gorgeous art! What Do They Make With It? Well, practically everything. From tableware like bowls, plates, pitchers, tea and beverage serving sets to decorative pieces such as flowerpots, candle holders, jewelry boxes, wall decors, or even daily used items like photo frames, photo albums, ashtrays, and pipes. Nowadays you can even find cute Minakari earrings, necklaces and rings! Below are some lovely works of art. You can see more and even buy some of them here: When the Minakar artisans want to overdo themselves, they combine Minakari with Khatamkari, Miniature and gilding. The results are some really high quality, valuable – and therefore priced to the roof – masterpieces in the shops and museums! Hand washing pitcher and basin, made with gold and Minakari, belonging to 19th century. 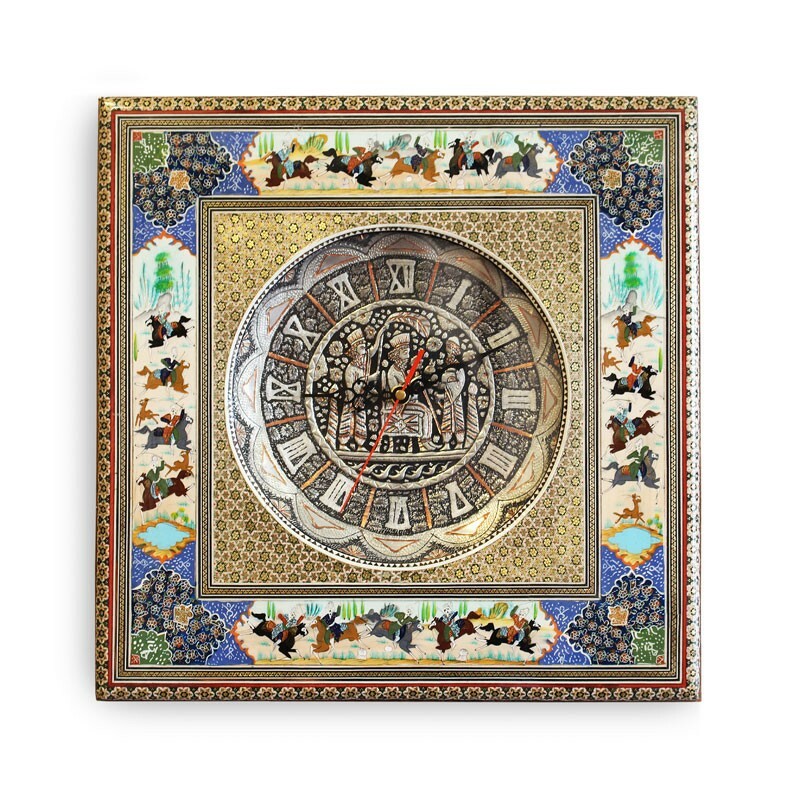 A contemporary wall clock made from a combination of arts. The middle circle is in scrimshaw, the middle square in Khatamkari, and the horsemen in white and blue background is Minakari. Buy one here. If you pay attention to the architecture of the important Islamic places or tombs of important Muslims (Imams, for example), you'll probably see lots and lots of Minakari on their walls, ceilings, and even chandeliers! 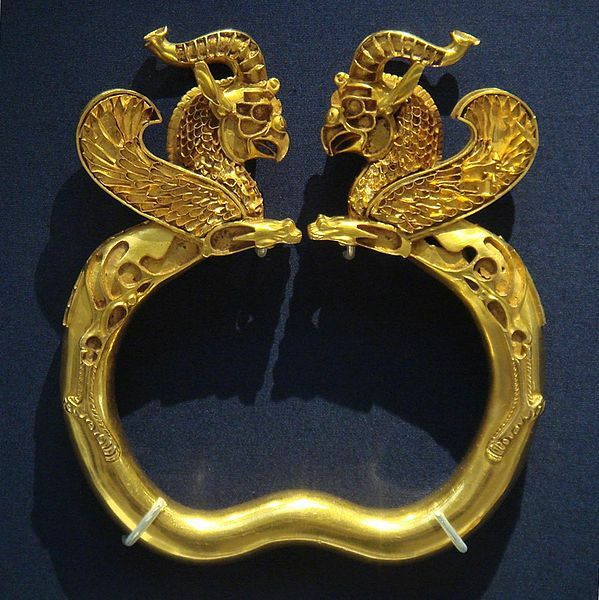 Gold and Minakari armband belonging to Achaemenid era. Victoria and Albert Museum, London. 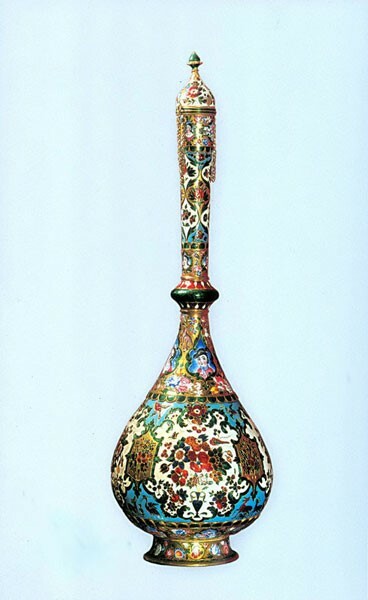 long-necked jug with flower designs and painting of women. This Minakari jug belongs to the 18th century. This method gets some help from narrow metal wires. You "draw" the outlines of the design with the wires on the surface of the metal sheet. you've got to make sure the wires won't fall, so they have to be secured by soldering or by using Mina colors. After the design is nicely fixed in place, we can start the coloring process with Mina oxide colors. That's probably the most fun part! After the painting is complete, the colored piece must now go into the kiln to be baked. Those wires we used before, they get hot much faster than our colors, and that might get us into trouble! They might start burning and get black and ugly before the colors are completely baked. 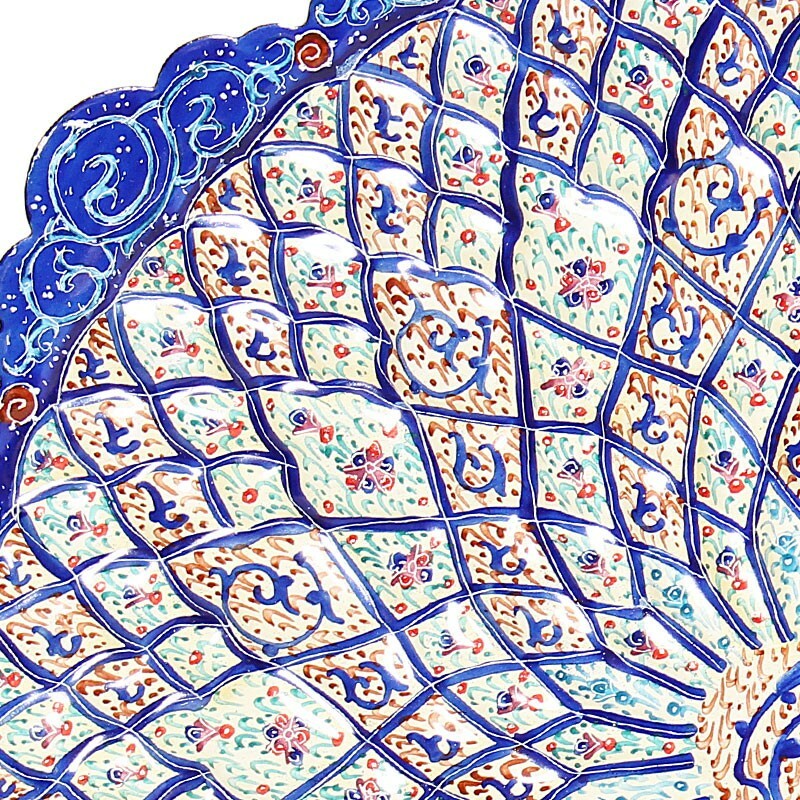 To avoid all that mess, the Minakar first covers the whole surface of his work with a colorless, glassy enamel. That'll do the trick, and keep all that hard work from going to waste. Although most Minakari artworks in the past were made with this method, nowadays it is far less used. 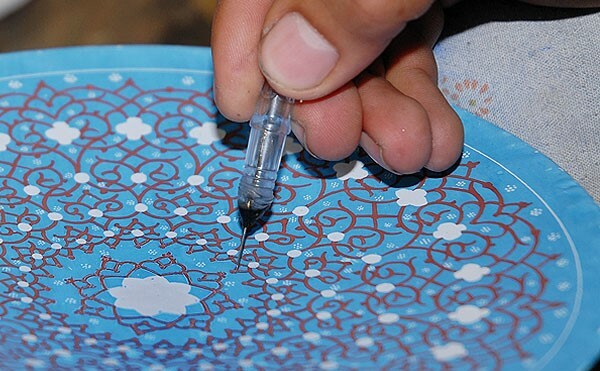 Today the popular method is an easier one, called the Painted Mina. You mix the color (which is actually a soft powder) with water and glycerin. On a glass or agate surface, the blend should be mixed thoroughly until it everything is solved in the water. After that, it's just a matter of simple watercolor painting. Instead of water and glycerin, the powders are mixed with pink ink or lavender ink extract. This will give a solution similar to oil based colors. After all the painting is done, it's time for the baking process in kiln. But before that, the artwork must be placed on alcohol lamp for some time. The medium heat from the lamp will help the ink in Mina burn and disappear. You might think it's quite easy, but this step is actually the hardest and the most important one. If the enamel work gets a little, even a tiny bit, hotter than it should, then the ink in Mina colors suddenly starts to boil and make bubbles all over the surface. One minute late, and all those hours of patience, hard work and eye pain is ruined! 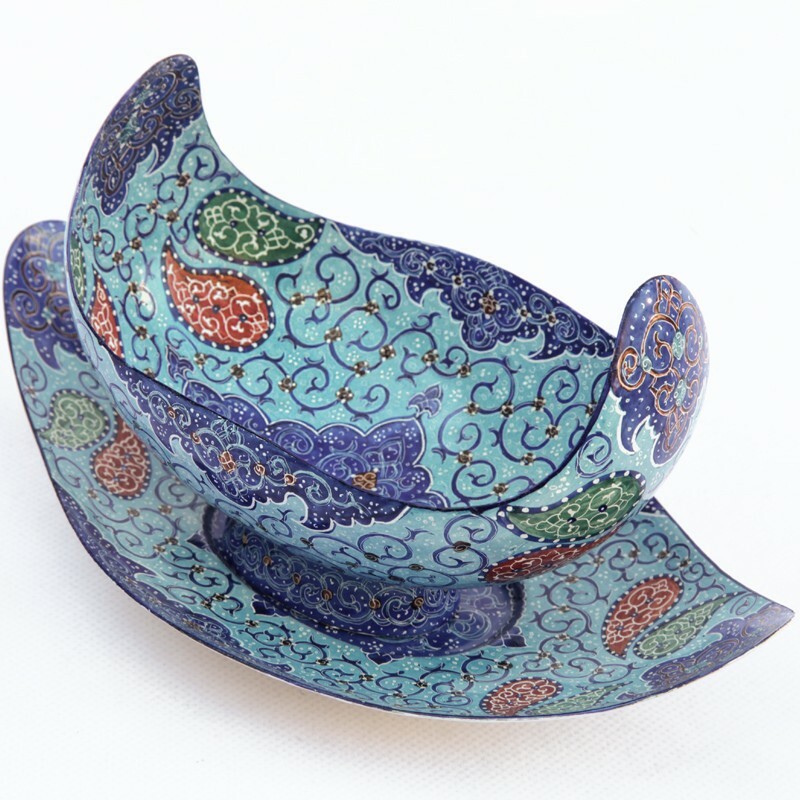 When the Minakari is out from the kiln, the Minakars usually cover it with a thin layer of transparent enamel, so that the surface becomes smooth to touch and shiny to the eye. The piece has another trip to make to the kiln, and when it comes out, the Minakari artwork is finally ready. Where Can I Find Minakari? 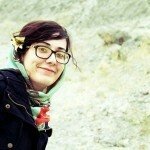 Through the history, Minakari has been popular in many cities of Iran. However, nowadays the Minakari workshops are mostly located in Esfahan and Tehran. Those are the places you can find the most authentic Minakari artworks, but there is no doubt that plenty of other places, including other countries, import them too. A Minakari set made in Isfahan. Available here. How to Tell a Good Minakari from a Bad One? Check the metal base. A quality Minakari has a thicker one, which ensures more durability. Notice the white parts. There isn't any white color in Minakari, so those white parts are actually the base enamel I explained above in painted Minakari. if is smooth and completely white, with no trace of the underneath metal sheet showing, then that means it's been enameled not once but several times. And that's a good thing. Colors are also a good hint. glossy colors are much better in quality than matte ones. Look at the patterns. Delicate, small and orderly patterns mean a more attentive and meticulous work. miniature design is also prettier than a big, coarse one. So if you have two choices on your hand and one has smaller flowers, that's the one you would want to take home! Although most Minakari works are done on metal, there is also another kind of enamelwork that is done on porcelain and clay. This kind of Minakari has been around for less than a century, and there are some quite fine artworks done with this method. However, everything in this post refers to the metal Minakari, not clay enamelwork. There is also another sort of Minakari that has its origins in India. This art is pronounced the same but spelled "Meenakari". Although the methods are quite similar to Iranian Minakari, the results are unbelievably different. The Indian way is mostly practiced on gold jewelry. These artistic creations cost a load of money, because in addition to being gold, they are paired with shimmering precious stones. Indian Meenakari is flamboyant and flashy, while the Iranian one is mostly peaceful and calm with its light blue colors that are never too glossy. The designs are also different. Iranian Minakari is all flowers and Eslimi entwined lines and twisting branches, whereas Indian Meenakari is full of animals and birds of all kinds. 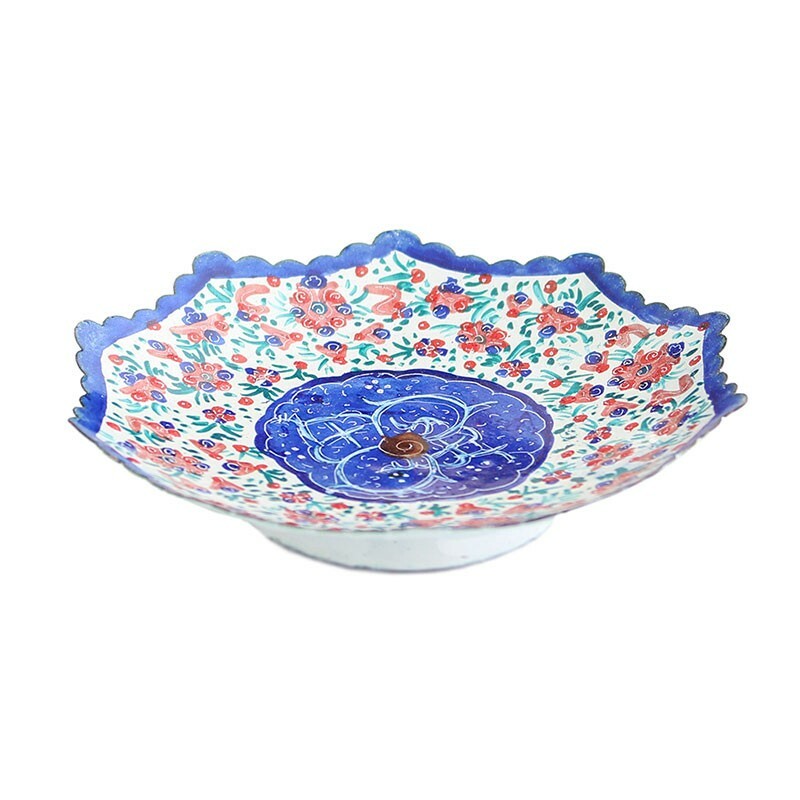 Cloisonne is the enamelwork of the Chinese. 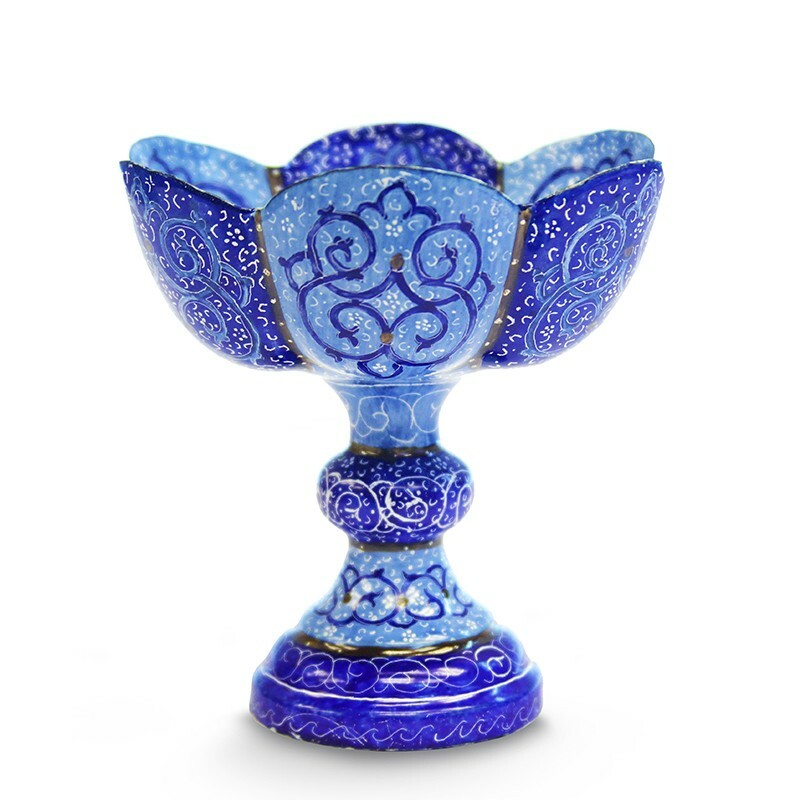 I'm not sure who affected whom, but It seems like the Iranians, Indians and Chinese enameling all have the same origin. 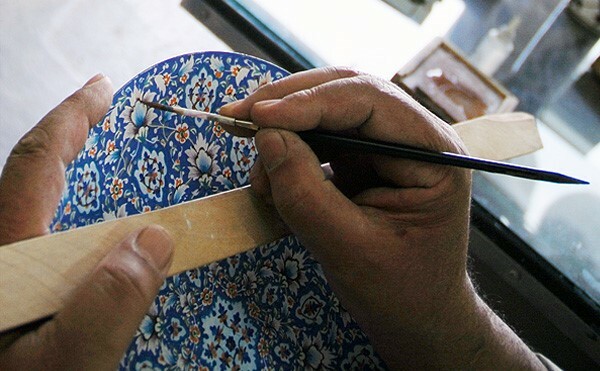 Cloisonne is similar in method to Khanebandi method of Iran, meaning the designs are first shaped by soldering metal wires. These designs scream "Chinese" from distant; it's so easy to tell them from Minakari. It isn't easy to Create a Minakari. It requires long and hard hours of relentless work, neck pain and eye burning. But as I've heard from Minakars, it is also incredibly relaxing and peaceful, just like painting. It's just another sort of it. Those peaceful paintings can speak for the souls who created them.